Chris Kenworthey's Mastermind (Any Card at Any Number) has been featured by Kreskin on both "The David Letterman Show" and "Live with Regis and Kathy Lee." Many top performers such as Wayne Houchin, Kreskin, etc. have stunned audiences using this powerful weapon in their daily work. 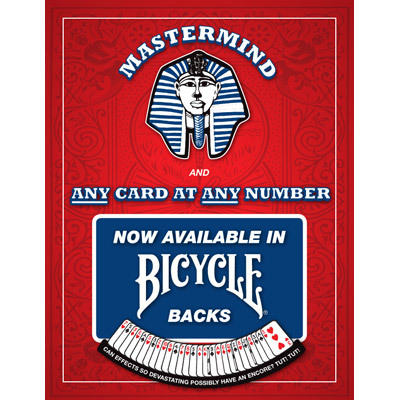 Mastermind is now finally available in Bicycle Playing Cards produced by the US Playing Card Company. 1. No forcing procedure of any kind is ever employed! This includes psychological, mathematical, spelling, timing or classic. Just fair, free, and clean. 3. No duplicate cards relied on. 5. No Himber Wallets or switching of envelopes or cards ever! 6. The prediction card is actually in the envelope for the entire week. It is the same card removed from the envelope by the mayor! 8. Can be done as a test in telepathy between two cities over the telephone. 9. Absolutely no sleight of hand required! 10. No long or short cards employed. Note: Available in RED Bicycle backs only.